My name is Fachtna ‘Doc’ Clandillon, a 39 year old Lucan born man living for the last ten years in Nepal. I am founder and chairman of a charity called Nagarhope Ireland, we have been running educational projects for ten years now in Nepal, and have opened a pre-school (upgrading to primary level) in 2014. Devastating earthquakes in 2015 damaged our original building, and we have since built a few better classrooms, though are still using temporary tin shelters as classrooms. I am full time in Nepal, married to a Nepali citizen, Divya, and have a daughter (5) and son (3). Together with Nepali friends, we also established Nagarhope Nepal, a Nepali NGO (Non-governmental Organisation), which runs the projects on this side. To run classes up to Primary Level (equivalent of Irish 6th Class) we require more classrooms, building methods have very strict guidelines since the quakes, especially for schools and community buildings. 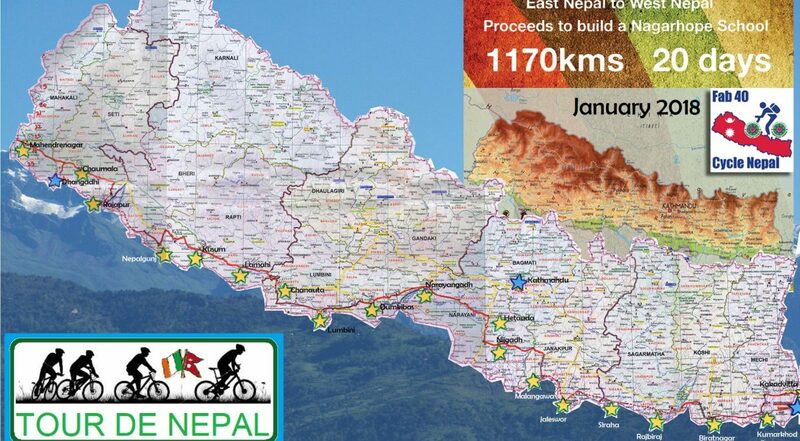 To raise funds for this endeavour, in the hope that we can have a 6-room primary block in place for the year starting April 2019, a team of 4 people (myself, Alan McGuinness from Sallins, Kildare and two Nepali nationals) will cycle east to west Nepal over 18 days in January 2018. The roads are both highway and offroad, with a fair few hills en route. The funds raised from this endeavour are going directly to fund Nagarhope Basic Schools’s said Primary Block, which in total (estimate) would cost about 70000 Euros (includingfurniture, toilets etc). The four of us are all in training for this event and have media involved on the nepali side as well as sponsors (including flights and accommodation). Attached is a map of the actual route. This cycle is going to coincide with my 40th birthday (January 31st 2018), I hope that we can raise at least 40000 Euros toward this worthwhile cause. If you’d like to donate, please click the Donate button below, or the following link: everydayhero/tour-de-nepal-cycle. Wishing you all a peaceful lead up to Christmas.